It is both timely and healthy that campaigning, lobbying and protest have taken centre stage again with political systems across Europe in perpetual crisis. A cursory glance at world history indicates that the powerful only yield when under mounting pressure. The end to slavery, suffrage for women and political equality for African-American community are mentioned as the most recognisable examples of this fact. There is a naïve tendency, however, to view protests in a negative light as if we’ll arrive at a utopia as some stage where such action will no longer be necessary. The veteran socialist Toney Benn, explained the fallacy of this contention, ‘‘It took me 50 years to work out that there is no glorious victory or final defeat because every generation has to fight again for the same rights but only in different circumstances.’ Without campaigning and lobbying, we can’t affect social, political and cultural change. Activists like Benn understood that parliamentary democracy was used to ensure the dispossession, marginalisation and disempowerment of ordinary people. ‘Representatives’ are elected who ‘understand’ the ‘will of the people’ and can speak on ‘our behalf’. All the average punter has to do is remain at home, avoid thinking for themselves and cast a vote for the most articulate liar! This explains why the political classes get so uncomfortable when faced by a wave of protests. Any challenges are often taken as a vote of no-confidence or a personalised attack. The powerful incite the official media to insult and belittle the campaigners in an attempt to divide political movements. This pattern can clearly be seen in the attacks being launched on the anti-water rates mass movement in the south of Ireland which have intensified in accordance with their increasing success. Closer to home in Irish language circles, the movement has recently undergone a political reawakening and with this an understanding that organised and consistent campaigning is essential to progress the needs of the community. Despite this, there was a strand of thinking amongst many activists, that energy would be better spent on bottom-up developmental action in the community rather than bothering lobbying the state for the crumbs from the table. This view emanates from our historical context where an Irish speaking community developed in spite of the state. Conversely, a new generation of activists are building an understanding that there is both the space and requirement for both approaches. An awareness that Gaels are entitled to resources from the state that won’t be gifted to us without creating public demand, while at the same time recognising that we shouldn’t become dependent on the state for the development of the language. This year’s Lá Dearg rally, for example, proved that a participatory and organic power can stem from a public demonstrations that give ownership of the language to the wider community. It builds solidarity rather than self-interest in which community oriented values and organisational skills are enabled that lead to a longer-term politicisation of individuals as citizens with rights in our society. This is both healthy and essential, especially with inequality on the rise. In the case of Irish speakers, strong relationships and alliances were built, new community projects developed, further protests organised, debates forged about alternative ways of progressing and a realisation dawned that we can make a difference and affect positive change. This was clearly illustrated when the ‘Tuistí an Tuaiscirt’ campaign grew from the Lá Dearg. Irish Medium school parents from North Belfast were to the forefront of the rally with a banner outlining their growing anger about how their kids were abandoned for travel services. Three years after Coláiste Feirste won a landmark court case against the Department of Education on the travel issue, both the school and its school parents were being ignored. With the support of activists, the parents developed their own campaign. They carried out community surveys and organised a ‘long walk’ from north Belfast to the school via the safest route which attracted huge interest from the media. This built public pressure and the Minster for Education agreed to meet the parents. He accepted their rights-based arguments and the Department subsequently provided additional funding for travel services for every child attending Irish medium schools from the north of the city. Another victory derived from campaigning. 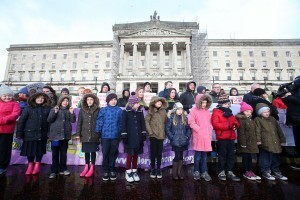 Additionally, the South Derry Irish language community stood shoulder to shoulder with north Belfast parents on the Lá Dearg demanding a stand-alone Irish-medium secondary school for their area. A young girl spoke passionately to the rally on their vision for post-primary education through the medium of Irish. They continued the lobbying, built extensive alliances and developed a creative and flexible approach to reaching their key objective. After many years of obfuscation, the Minister of Education announced last week that he has accepted the development proposal to establish Coláiste Dhoire as a stand-alone post-primary school. 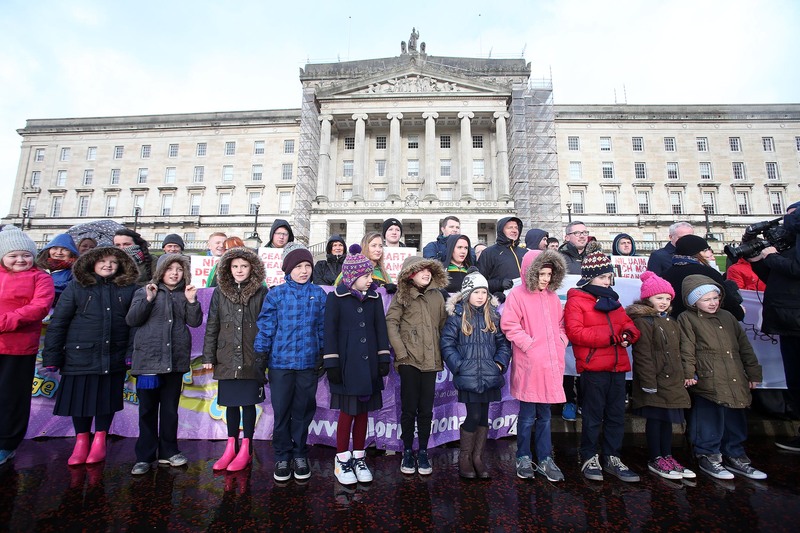 While the fight for an Irish language Act continues, as indicated by last week’s anti-racism rally in Stormont, these victories prove that we can achieve winnable gains. It is preferable if the organising approach is based on a core principal of empowerment that recognises the central role of those directly affected by inequality or those who’ll participate in the developing vision. The campaign against water rates has shown that a wide range of tactics can be effective when challenging those with power. Both direct action and civil disobedience were effective in further pressurising the authorities in the south. Welsh language activists have also historically utilised these approaches to good effect in the past in gaining parity of esteem for the welsh language. This doesn’t mean, of course, that using these tactics will always be a good idea but it undoubtedly provides options that could be effective in certain contexts and circumstances. It is clear therefore, that movements and activists should maintain a creative, strategic and pragmatic stance when aiming to achieve objectives. As Fran Buntman states, ‘resistance is not simply about saying no, reacting, refusing, resisting, but also and primarily about social creativity, introducing new values and aims, new forms of co-operation and action’. This can ensure a flexible methodology that embeds radical bottom up activism while providing a movement with succour from complacency and institutionalisation in the years ahead. Is tráthúil agus sláintiúil go bhfuil cúrsaí feachtasaíochta, stocaireachta agus agóidíochta ar ais i lár an aonaigh agus córais pholaitiúla na hEorpa i ngéarchéim leanúnach. Ní gá ach sracfhéachaint a ghlacadh ar stair an domhain le féachaint nach ngéilleann lucht na cumhachta ach nuair a chuirtear faoi bhrú iad. Ainmnítear deireadh le sclábhaíocht, vótaí do Mhná agus cothromas polaitiúil don phobal ghorm i Meiriceá mar shamplaí aitheanta den fhíric seo. Bíonn claonadh neoid, áfach, chun féachaint ar chúrsaí agóidíochta mar chomhartha diúltach amhail is go dtiocfaidh lá útóipeach nuair nach mbeidh gá ann lena leithéid. Mhínigh an seansóisialach iomráiteach, Tony Benn, an dallamullóg seo nuair a dúirt sé, ‘It took my 50 years to work out that there is no glorious victory or final defeat because every generation has to fight again for the same rights but only in different circumstances.’ Gan feachtasaíocht agus stocaireacht, ní tharlaíonn athruithe sóisialta, polaitiúla agus cultúrtha. Thuig gníomhaithe cosúil le Benn go bhfuil an daonlathas parlaiminte in áit le cinntiú go ndéanfar díshealbhú, imeallú agus díchumhachtú ar an chosmhuintir. Toghfar ‘ionadaithe’ a thuigeann ‘toil an phobail’ agus a labhraíonn ‘ar ár son’. Ní gá don ghnáthdhuine ach fanacht sa teach, gan bacadh le bheith ag smaoineamh agus vóta a chaitheamh gach ceithre bliana don bhréagadóir is deisbhéalaí. Seo an fáth a n-éiríonn na haicmí polaitiúla iontach míchompordach nuair a thagann rabharta agóidíochta. Glactar go minic le dúshlán ar bith mar chomhartha mí-mhuiníne agus ionsaí pearsanta. Spreagann siad na meáin chumarsáide oifigiúla chun lucht feachtasaíochta a mhaslú in iarracht chun gluaiseachtaí a scoilt. Tá seo le feiceáil go sonrach leis na hionsaithe in aghaidh na hollgluaiseachta frith-Tháillí Uisce ó dheas de réir mar a éiríonn siad níos rathúla. Níos cóngaraí don bhaile i saol na Gaeilge, tá athmhuscailt pholaitiúil i ndiaidh teacht ar ghluaiseacht na teanga agus leis sin, an tuiscint go bhfuil gá ann le feachtasaíocht, eagraithe leanúnach chun miantaí an phobail a bhogadh chun cinn. Bhí claonadh smaointeoireachta, mar sin féin, i measc roinnt díograiseoirí, gurbh fhearr díriú ar an ghníomh forbartha ón bhonn aníos sa phobal seachas bacadh le stocaireacht leis an stát le haghaidh pinginí ón tabla. D’eascair an tuairim seo ón chomhthéacs stairiúil s’againne inar fhorbair Gaelphobal in ainneoin an stáit. Ach, tá glún úr de ghníomhaithe ag tógáil feasachta go bhfuil spás agus gá ann don dá chur chuige. Feasacht go bhfuil Gaeil i dteideal acmhainní ón stát nach bhfaighidh muid gan an t-éileamh poiblí a chruthú ach ag an am chéanna níor chóir bheith spleách ar an stát le haghaidh forbairt na teanga. Léirigh An Lá Dearg i mbliana, mar shampla, gur féidir cumhacht rannpháirteach, orgánach teacht ó shlógadh phoiblí a thugann úinéireacht don mhórphobal ar chúis na Gaeilge. Tógann seo dlúthpháirtíocht seachas féinshuim ina bhforbraítear luachanna pobalbhunaithe agus scileanna eagrúcháin a dhéanann polaitiú fadtéarmach ar dhaoine mar shaoránaigh le cearta sa tsochaí s’againne. Tá seo sláintiúil agus riachtanach agus éagothromas ag treisiú i rith an ama. I gcás na nGael, tógadh caidrimh láidre, forbraíodh tograí pobail úrnua, tuilleadh agóidí, osclaíodh díospóireacht ar bhealaí úra chun cinn, agus d’fhás tuiscint gur féidir linn difear a dhéanamh agus athruithe a bhaint amach. Léiríodh seo go sonrach nuair a shíolraigh feachtas Tuistí an Tuaiscirt ón Lá Dearg. Bhí tuismitheoirí as tuaisceart Bhéal Feirste chun tosaigh ar an mhórshiúl le meirge agus iad feargach gur fágadh páistí s’acu ar an trá fholamh maidir le seirbhísí taistil. Trí bliana i ndiaidh an chás cúirte a bhain Coláiste Feirste in aghaidh na Roinne Oideachais ar an cheist taistil, bhí cluas bhodhar á tabhairt go fóill don scoil comh maith le tuistí Gaelscoile agus a gcuid ceart. Le tacaíocht ó dhíograiseoirí, d’fhorbair na tuismitheoirí feachtas s’acu féin. Rinne siad suirbhé, d’eagraigh siad mórshiúl ón tuaisceart ar an treo fhada chun na scoile is mheall siad spéis na meán cumarsáide. Chothaigh seo brú poiblí agus d’aontaigh an tAire Oideachais bualadh leo. Ghlac sé le hargóintí ceartbhunaithe s’acu agus chuir an Roinn maoiniú breise ar fáil le haghaidh seirbhísí taistil do gach páiste gaelscoile i dtuaisceart na cathrach. Bua sonrach a d’eascair ón fheachtasaíocht. Le cois, bhí Gaelphobal Dheisceart Dhoire ar an mhórshiúl ag seasamh gualainn ar ghualainn le tuistí ón tuaisceart ar an Lá Dearg ag éileamh meánscoile saorscartha don cheantar. Labhair Cailín óg go paiseanta os comhair an tslua ar an lá faoin aisling s’acu maidir le hoideachas dara leibheál trí Ghaeilge. Lean siad leis an stocaireacht, thóg siad comhghuaillíochtaí leathana, is d’fhorbair siad cur chuige cruthaitheach chun an mhórsprioc a bhaint amach. I ndiaidh blianta fada moilladóireachta, d’fhogair an tAire Oideachais an tseachtain seo caite gur ghlac sé leis an mholadh forbartha chun Coláiste Dhoire a bhunú mar mheánscoil scartha. Leanann an troid ar son Acht na Gaeilge ar aghaidh, mar a thaispeáin an slogadh frithchiníoch ag Stormont an tseachtain seo caite ach léiríonn na buanna seo go dtig athruithe a bhaint amach. Is amhlaidh is fearr má fhorbraítear cur chuige atá bunaithe ar bhuphrionsabail cumhachtaithe a aithníonn ról lárnach dóibh siúd atá thíos le hidirdhealú, nó a bheas páirteach san aisling. Taispeánann an feachtas i ndiaidh na dtáillí uisce go n-oibríonn réimse leathan taicticí agus tú ag cur dúshláin roimh lucht na cumhachta. D’oibir an gníomh díreach agus easumhlaíocht shibhialta chun brú breise a chur ar na húdaráis ó dheas. Bhain gníomhaithe teanga na Breataine Bige feidhm éifeachtach as an chur chuige fosta chun roinnt mhaith ceart teanga a bhaint amach. Ní chiallaíonn seo gur smaoineamh maith atá ann i gcónaí ach is cinnte gur rogha streachailte atá ann a bheadh éifeachtach i gcomhthéacs agus cúinsí ar leith. Ar ndóigh, is léir gur gá do ghluaiseacht agus díograiseoirí bheith cruthaitheach, straitéiseach agus pragmatach chun cuspóirí a bhaint amach. Mar a deir Fran Buntman, ‘resistance is not simply about saying no, reacting, refusing, resisting, but also and primarily about social creativity, introducing new values and aims, new forms of co-operation and action’. Cinnteoidh seo cur chuige solúbtha a dhearbhaíonn gníomhachas radacach ón bhun aníos agus a bheireann cosaint do ghluaiseacht na teanga ó bhogásacht agus institiúidiú sna blianta amach romhainn.